Novemeber is just a few weeks away. So far, we have two YouTube acts, Boyce Avenue and Megan Nicole, coming to Singapore. 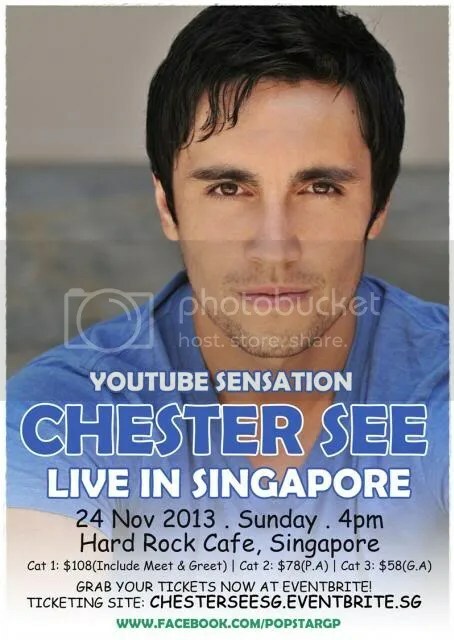 Say hello the next YouTube act,Chester See who will be in Singapore on November 24. Popstar Group presents Youtube Sensation: Chester See Live In Singapore on 24 November 2013 for a one-night only performance at Hard Rock Café,Singapore. Chester See is an actor, musician, singer-songwriter and comedian. In 2006, he hosted Disney Channel’s, “Disney 365” and began writing music for Warner/Chappell Music. He started uploading original music and covers on YouTube in 2007 and since garnered more than 1 million subscribers. If you missed the chance to catch Chester See in May for YouTube Fanfest, this is your chance to meet him! You can purchase the tickets on Eventbrite from 11 October at 10am. For more information, you can contact Popstar Group through Facebook and Twitter.